What I like a lot about bagley is his mean streak. Fox has it too. Not sure it’s something you can scout or foresee but they have it. I think it’s really important for success in sports. You can see it in bagley after that dunk last night and the one in summer league. Great point. I couldn't agree more. I said this before but I think it bares repeating. Bagley, unlike other picks, did not have top level skills coaching prior to entering the league. His dad, a football coach, was the coach of his AAU team. Most college coaches use the summer and September to develop skills and Bagley came in late as he changed his draft class. The result is Marvin is for the first time getting professional coaching and you can see it in his rapid improvement. I’m still a little confused about this reclassifying regarding his HS to college timeline. If he’s born in 1999 wouldn’t he have graduated in 2017 anyway? Exactly. People think that he is younger than his draft class, but in reality he probably just repeated a grade in elementary or middle school and made it up by his junior year of HS in order to graduate in time. So while he was a junior in HS, he should've been a senior. He just really wanted to play for Duke instead of staying another year in HS. Birth year 1999 was the minimum for the 2018 class. On another hand, it should be noted that it's pretty common for athletes to be a year than their class year. Some parents hold their children back a year to help them gain an advantage. Ya, I was leaning towards him being held back in his younger days. He transferred schools a lot. He probably lost credits due to curriculum not transferring over or time missed. When I saw Bagley play at Duke, I said he's just a jumpshot away from being a star. When he's able to hit that 3 pt shot consistently, he'll be unguardable and will move into the rare air area occupied by the Durant's and Lebron's of the world. I firmly believe that! I agree. He's going to be better than Fox. Buddy, Fox, and Bagley. It's an insanely talented trio. I can get carried away thinking about how much talent we have on our team. I'm revising my forecast upward for Bagley. Next year, he's 23/12/1.5blk. Year after that he's 25/13/2blk. I can't believe it was only like two weeks ago that I was laughed at for suggesting Bagley will be 20/10 next year. Don't think people would laugh at that now. Bagley was initially pegged as the future 1st overall pick for a while by multiple outlets. I'm not sure when things changed or why he dropped on people's draft boards. With first pick I would have picked Ayton and I think with our development program he would be better than he has been at Phoenix. Always said that Lika was going to be very good right from the start and will win the ROY comfortably (especially once he went to Dallas). I wanted Bagley at 2 because his upside is HUGE and he could easily end up being the best player from his draft class when we look back at their respctive careers. One thinyis pretty clear to anyone paying any attention. It’s one hell of a draft class. It is common for most elite prospects to play a year behind their class. Not always, but common. As it relates to Bags, he was held back a year. When his parents realized that he would be a top lotto pick in 2018, they crammed a ton of educational credits and had Bags reclassify to the 2017 to 2018 freshman class. His reclassification caught a bunch of colleges off guard, which lead to him missing out on practice with the Duke team in the spring and summer before his FROSH year. He was taking classes. The disconnect is here: most high level recruits are now skipping the 2h of their senior HS years (or, at a minimum, attending summer school before their FROSH year) in order to get a head start on the playbook and to practice with the team. That's what people are implying when posters (me and others) say the defensive BBIQ issues were over blown. He was learning on the job. Didn't have any prep prior to arriving on campus (unlike his peers). And 1: Shabazz Muhammed's parents straight up lied about his age. He was like a 20 year old freshman, but they were saying he was 19. It came out in the latter half of his FROSH year. And 1 #2: Taj Gibson, because of the above practice and educational issues, was like a 22 year old freshman at USC. And 1 #3: OJ Mayo was, I believe, like almost 20 (19+) when he entered USC. It’s not about age. It’s about most basketball players come in early and start working out and working on skill development prior to the season starting. Bagley by reclassifying missed all that. Once in season it’s more about game prep than skill development. 1) Bagley checks into the game. 2) I sip my soda and check my twitter for like 60 seconds. 3) I look up at the box score and Bagley has 8 points and 4 boards. Against Philly Marvin was guarding Ben Simmons part of the game. Last night he defended Rudy Gay for some time. Marvin's defense and blocking ability is getting the attention of opposing teams. What an incredible Duo Marv and Harry make going forward for the Kings. When have things ever been this good for us Kings Fans? At the start I thought you were heading to the play him at SF BS. The "nobody really knows" argument is not valid, it can be applied to literally any young player. It's not an argument for anything. I'm not putting a cap on Bagley's potential, don't get it twisted. He might end up being better than Giannis. He's definitely not going to be the passer or ball handler he is though, no more than Fox is going to be the shooter Steph is. Different skillets, it's not hard at all to see. You do realize that when Giannis came into the league he wasn't a great passer or ball handler, so we really don't know how good Bagley will eventually be, but I do think we can agree that he's definitely going to be very good. Hey, I don't think Giannis is done improving either. His 3 pt shot is getting better and will continue to improve. It's weird how people think originally, and perhaps, how that thinking might influence the final result. Everyone knew that Curry could shoot, but most people thought he was more of a SG than a PG, and that he'd never be able to defend in the NBA. Guess what, he got much better in the area's he was criticized. I suspect that Fox will do the same. Should be fun to watch. Why does it matter what Giannis looked like coming in that doesn’t mean Bagley will be the same player as him. Giannis is literally a generational talent how some of you are comfortable comparing Bagley to him is beyond me. And as explose and elite an athlete Bagley is Giannis is still a level above. It’s the same stuff we did with Giles passing with Jokic passing. Just because they won’t reach that isn’t bad those guys are top notch elite of the elite. And as explose and elite an athlete Bagley is Giannis is still a level above. I dunno about this, Bagley looks pretty insane himself. Giannis is def still a level above. When you see him play the guy legit looks like a statue you'd see of a Greek god in Ancient Rome or something. Bagley is definitely an athlete but he needs to hit the weights. People forget how young these kids are.. they are years away frome being physically and mentally matured.. for example everybody is saying yeah put MBIII play 35 minutes per game, every game he is young.. but this is a problem, he did not finish his developement, his body structure is much weaker comparing to 26 year old player od older..
two things really amaze me.. first one is how every single guy on this team is getting better as time goes by, how everyone has its own when he is coming of the bench, when he is starting, when he doesn't even see the court.. everything is perfectly calculated..
and second these guys are good, and then I see how young they are.. just wow..
Fair assessment re: Bagley and Ant but... disagree with Giles/Jokic... Once Giles gets more consistent minutes he'll be making passes consistently that will blow your mind. As talented as he is it is his #1 weapon. Feel free to call me out in 2 years once he's fully settled in. It's the above the rim and post play that will set Bagley apart. That part of his game is on an entirely different level than Ant. Bagley could still end up being better, but I'm not calling that now, too early. He will be in the HOF though. I think we have 3-4 future HOFers on our roster: Fox, Bagley, Buddy, and possibly Giles. It took 6 years for Giannis to get the physique he has now and to propel himself into MVP talk. I find it interesting that anyone would write off Bagley so quickly for any reason. Bagley's mind, desire and drive are all in the right place. His athleticism is off the charts. The only thing left is time and opportunity. As long as his situation remains right, the sky is the limit. Yeah, in that Giannis rookie pic, he looks maybe a little more cut than Marvin, but basically a very similar body type and strength. 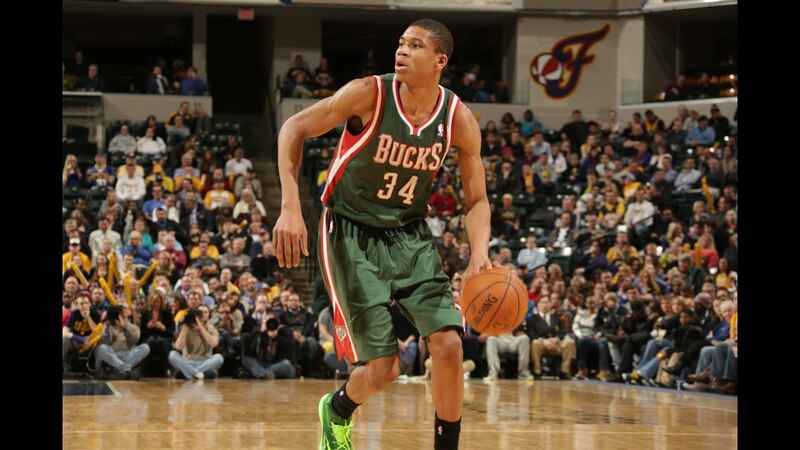 Giannis has grown not only in strength but I believe in height since his rookie year. He is otherworldly as far as length, which just accentuates his athletic ability. While I don't think Marvin's body will develop to that extreme, it's not CRAZY to think of Giannis as somewhat of a role model for how his development could go. I love your optimism Hammer. If we can get one or two HOF's out of this team I think we'll be OK! One game at a time Grasshopper. Now that the Kings have a winning record, is not the time to start talking about the Hall of Fame. What's this Bagley defense talk? Wasn't he ranked dead last among PF's like a week or two ago? I don't know what the numbers say. I don't think he's a "great" defensive player, but to me he at least passes the eye test. Maybe it's because he's constantly going at 110% hustle, but that's a huge part of defense anyhow. Still 22 games to go in the season, but I thought I'd post this for comparison sake. It's MB3's current season compared to DeMarcus Cousins rookie season in 2010/2011. Boogie turned 20 before his rookie season began whereas Marvin is and will be 19 for most of his. Very similar numbers. Except MB3 has done it in fewer minutes. MB3's shooting numbers are much better overall and he has half the turnovers. While they are two different players, I think this comparison demonstrates that Marvin is well on course to becoming a pretty darn good player. It's likely many of his season ending numbers will be better than above, considering how he's performed in recent weeks.